The best Sony digital SLR camera leverages a unique mirror system to provide continuous high-speed autofocus in all camera modes. This same mirror system allows this camera to capture images at a record speed of 12 per second, which should be plenty fast for all kinds of action junkies. Once you pile in a host of other features that will also appeal to portrait, landscape and wildlife photographers you've got a feature-rich camera with a relatively reasonable price tag for said features. So what camera is this? 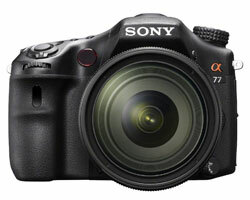 The defining feature of the Sony SLT-A77 is something that you can't even see: the mirror system inside the camera. In other digital SLRs, this mirror is like any other you've ever seen: it reflects 100% of the light that passes through the lens up to the autofocus system and the viewfinder. When you take a picture, the mirror flips up (temporarily blocking the autofocus and viewfinder) to allow the sensor to be exposed to light. By contrast, the mirror inside the Sony SLT-A77 is translucent: it reflects some light up to the autofocus system while also allowing light to pass through onto the camera's sensor. 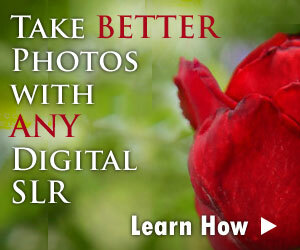 This means that neither the autofocus system nor the viewfinder is ever blocked by the mirror. The main impact of this special mirror system is that the A77 can leverage its responsive 19-point autofocus regardless of the mode the camera is in. You can take pictures using the viewfinder and the flexible LCD or you can capture videos, and you won't ever notice the autofocus acting sluggish. This feature is especially helpful for non-professional videographers who aren't used to manually focusing a lens when shooting movies. It's also helpful for portrait photographers who want to compose photos using the LCD rather than the viewfinder so they can maintain eye contact with their subjects. One issue with the translucent mirror is that the viewfinder must be electronic instead of optical. Electronic viewfinders are notoriously bad at replicating the optical performance of analog viewfinders - since they are small video screens, any delay in processing the video image results in a poor viewfinder image. Sony has attempted to address this issue by creating a high resolution OLED ( Light Emitting Diode) viewfinder, the first of its kind in a digital SLR camera. The performance of the OLED viewfinder far exceeds the capabilities of older electronic viewfinders. Flexible viewfinders are all the rage on digital SLR cameras, but the one on the Sony SLT-A77 has its own special flair. While the viewfinder flips down and up for high and low-angle photos and videos, a secondary hinge allows it to flip up above the top of the camera and below the bottom. In addition to unique points of view, this viewfinder also lets you take self-portraits since you can see the LCD even when standing in front of the camera. Panoramic landscape enthusiasts used to have to spend a lot of time in front of the computer, blending multiple images together. With the SLT-A77, you just have to press the shutter release and then pan the camera across the scene and it automatically creates a panoramic image for you. Landscape photographers can also leverage the auto HDR (High Dynamic Range) mode, where the camera takes multiple exposures and then blends them together into a single image with more detail in the shadows and highlights. Finally, those obsessed with location can geo-tag every photo they take thanks to the built-in GPS feature. This can be leverage later to position photos on an interactive map.